Your Guide To Finding Taiyaki Ice Cream in OC and LA - EAT WITH HOP! Are you dying to try ice cream in that fish-shaped cone? It's called Taiyaki Ice Cream which originated in Japan. Popular in Asia, this insta-worthy creation is gaining popularity in Los Angeles and Orange County. Find out where to get it with this helpful guide! YUM! They make it all fresh here at SomiSomi. It's my favorite place to get the Taiyaki Ice Cream since it's fresh and soft serve is delicious! There are a lot of toppings to choose from too like Oreos and Fruity Pebbles and nuts and sprinkles! For around $6, this is pricey but worth it since it's actually good compared to other places. I recommend this place the most! Parking Tip: There is validated parking! Validate at SomiSomi and get 2 hours free parking in the structure! At Snow Heaven, you can satisfy your shaved snow cravings and transform into... an angel! They have an awesome insta-worthy wall where you can grow wings! No need for Red Bull! Snow Heaven specializes in Shaved Snow and also has boba / tea drinks using real fruit purees. They just recently added Taiyaki Ice Cream to their menu! Chelo Creamery located in Rowland Heights is sorta like a one-stop dessert shop. They have ice cream, italian ice, macaron ice cream sandwiches, Thai-style rolled ice cream and now... Taiyaki Ice Cream (they use soft serve for this). I remember going here for the Thai ice cream rolls and waited an hour... Why? Because they do not specialize in it. So many things are going on at once. They only have 2 freeze plate to make the Thai ice cream rolls. So hopefully, Taiyaki Ice Cream won't take that long to make. And hopefully, it's made to order because those fish shaped breads are way better fresh. If it isn't, it'll be all hard and ugh. I have yet to try it but the long lines is a turn-off. They currently have matcha, vanilla and black sesame soft serve. Crave Boba in Garden Grove is another one of those one-stop dessert shops that tries to be a jack of all desserts but an expert in none. I was so excited that they had this Taiyaki Ice Cream added to their menu because it's so close to my house. But I was disappointed. Once again... Do I ever learn.. !?! The Taiyaki Ice Cream here is served with either Black Sesame Soft Serve or Matcha Soft Serve. The Taiyaki fish bread thing is not made fresh. The soft serve was very icy. Black Sesame was not good so I got the Matcha Soft Serve instead. Fish-cone-bread thingy was "harder than a 12 year old's d***" according to Kevin. 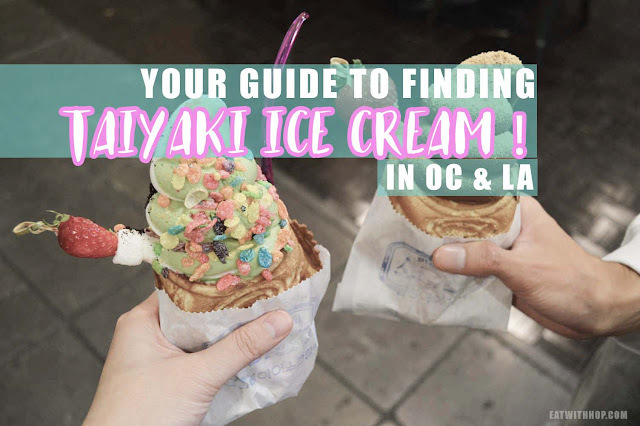 Know any other shops in the Los Angeles or Orange County area that sell Taiyaki Ice Cream to add to this list? Comment below to let me know or e-mail me at GetHungry@EatWithHop.com!